You should never make promises, to anyone, when you go fishing. 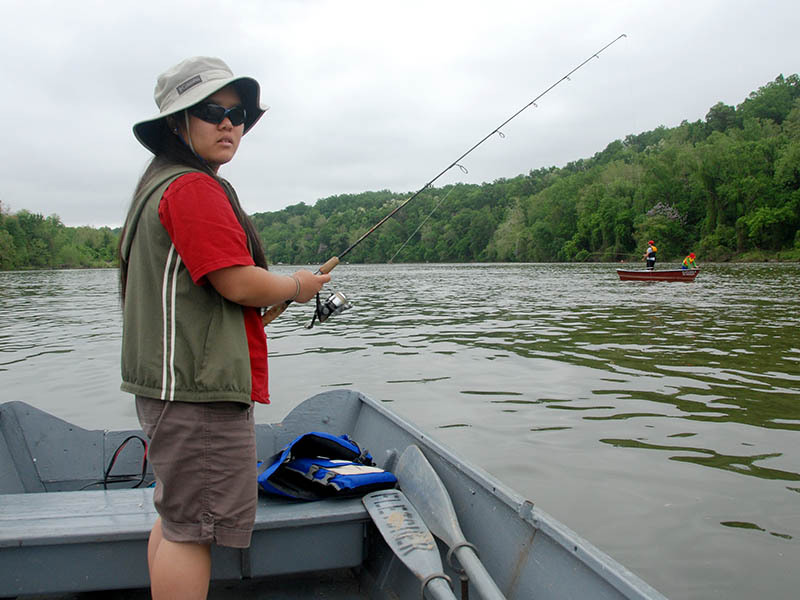 There’s a reason they call it “fishing” and not “catching.” When the bite is on you can have a day like I had last week with Jin, when it was a fish on just about every cast and you finally call it a day because your arm just can’t take stripping in another Hickory or American shad with your fly rod. Then there’s a day like today, when the water conditions aren’t the greatest, the shad are being uncooperative and you’re dogged by equipment problems. And what made everything worse was dragging your daughter out at 4:30am to Fletcher’s Boathouse because you told her the fishing would be awesome. The Girl is not a morning person. 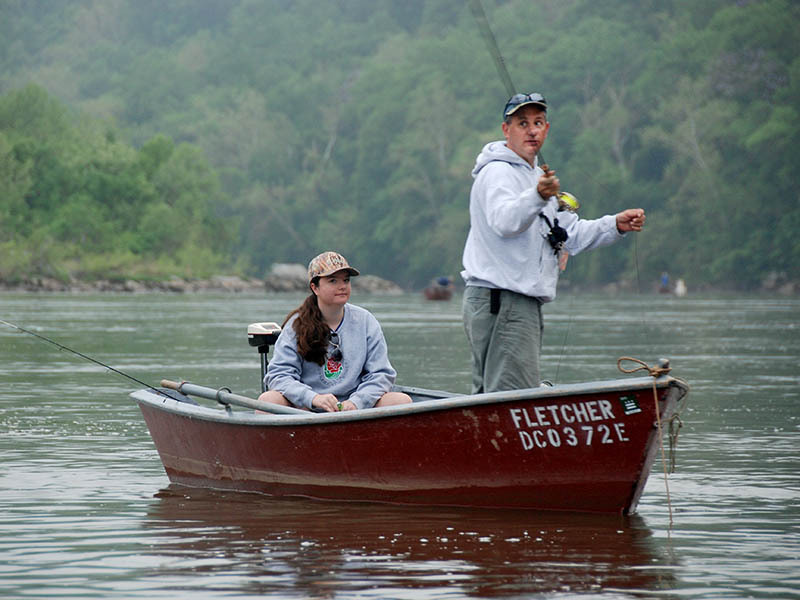 Like most teenagers her “day” usually begins closer to noon than at dawn so for her to make the commitment to dad to get up, get dressed and head in to D.C. to fish for shad on the Potomac River was a major undertaking. She does like to fish but getting up early is not easy but after I told her we needed to be at Fletcher’s Boathouse early in order to secure one of the 22 rowboats before they were all gone she agreed to do it, especially since a school friend was also going to be there with her dad, Mr. Bass Master. We arrived at the dock and quickly secured a boat with a good rock. Since there was only one other person at the cove setting up a boat I told her to run up to the Fletcher’s kiosk to stand in line while I prepped the vessel. She did so then posted a photograph of the kiosk on social media telling all her friends where she was, what time it was and that she was standing in line with nobody behind her instead of sleeping at 5:30am on a Saturday morning. Luckily I wasn’t mentioned in the post but I’m sure they all could guess who she was with. Mr. Bass Master showed up with his daughter and we both motored out of Fletcher’s Cove. We thought we’d try heading up river, but the current was too strong. However it was at this time that I detected a problem with the 50lb-thrust electric motor--it seemed sluggish and it felt like we weren’t getting full power with the throttle maxed out. I just figured the current was too strong for us to both Mr. Bass Master and I turned around and were soon anchored up and fishing just outside the main current. The fishing was extremely slow. The Girl is not into fly fishing so I brought several spinning rods along and rigged them with shad flies that we had been using for the past several weeks. I showed her where to cast and how deep to fish and let her loose while I tried fishing the water column to find out where they were holding. Mr. Bass Master caught the first shad on his fly rod but for the next hour we caught the bottom more than we did fish. 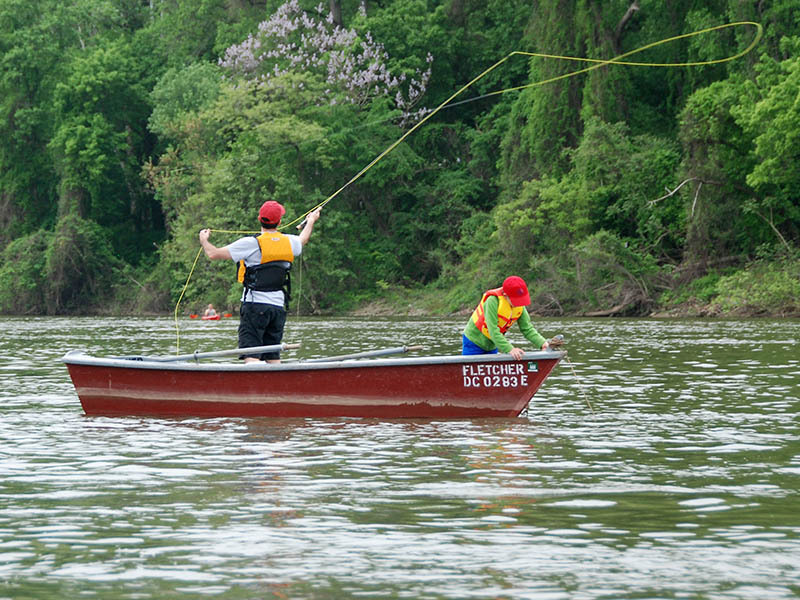 The Girl finally hooked something that wasn’t permanently attached to the bottom of the Potomac River. A very nice Hickory shad was pulled to the boat but when I tried to bring it in for a photo it slipped the hook. The Girl said the bite came just behind the boat as the fly was coming up off the bottom so I told her to throw it back to the same spot and do the same thing again, hoping that finally the bite was going to pick up and we’d get some decent shad action. No such luck. It was back to casting and casting and casting with no bite. 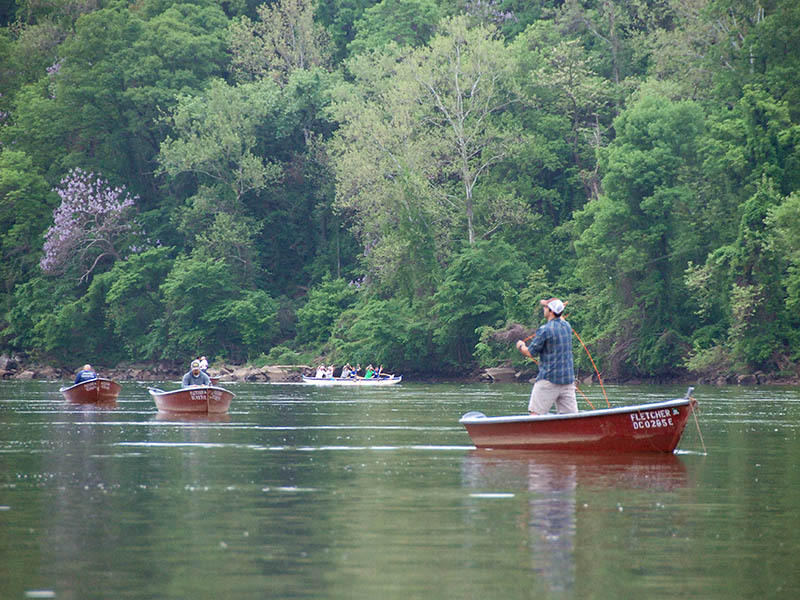 Other boats weren’t having much luck either and I figured it was because the water was colored from the previous week’s rain and the shad season was winding down, with most of the fish now up the Potomac near Chain Bridge. I told Mr. Bass Master that we should head for the Virginia side where the current wasn’t as strong and maybe we could make it up to Gordon’s Rock or Catfish Beach. Mr. Bass Master passed us and was soon a good distance up the river. We had a problem. We were losing way, being dragged down river by the current. This should not be happening because with a 50lb-thrust motor we should be able to keep up with Mr. Bass Master and his 28lb-thrust motor. I spun the boat around and headed back to the quiet water just outside Fletcher’s Cove for an engine and battery check. The prop wasn’t fouled so that meant it could be a battery problem. I connected a power meter and as I suspected the charge read close to zero so the battery was shot. The battery was charged for a full day and the meter was pegged into the green so this meant the battery was probably done for. After seven years it was probably time for a new one anyway but it was a bad time for a bum battery. I called Mr. Bass Master and told him about our problem and said we’d try our luck outside Fletcher’s Cove. Mr. Bass Master had made it up river and said they’d fish in a spot where he caught a bunch on his last trip a few days ago. He later told me it wasn’t much better and thought the season was winding down. The Girl and I fished for a bit longer and she caught a few perch but no shad. Other folks around us weren’t doing so hot either so we decided to call it a day and grab some lunch on the way home. 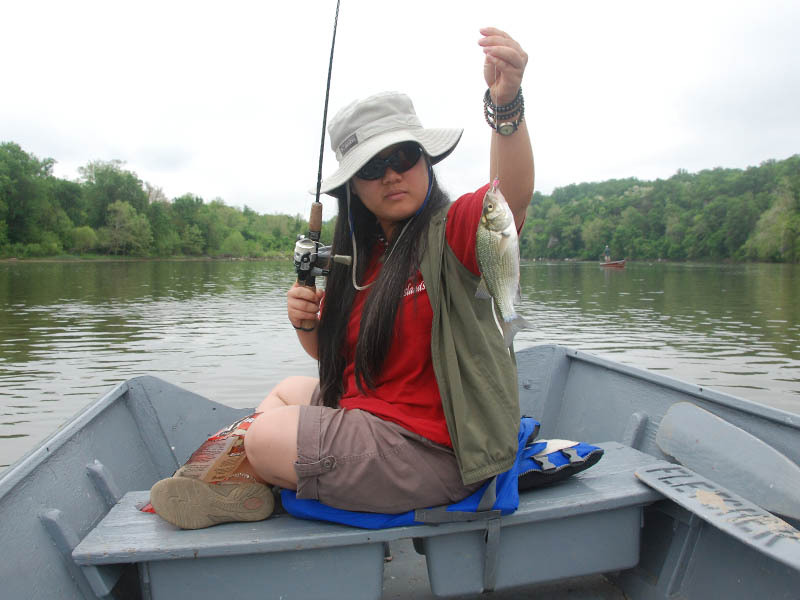 EQUIPMENT: We used spinning rods and a variety of shad flies in a wide selection of colors.